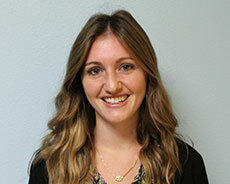 Born and raised in New England, Pamela finished her graduate work, and chased the sunshine all the way to California. Her passion for working with children and adolescents has guided her practice as an occupational therapist. With over five years of experience as a pediatric OT, she has had the opportunity to work with children and adolescents with varying needs, across clinic, home, and school environments. Pamela has maintained her license through extensive continuing education in sensory integration, motor skill development, cognitive skills and processes, and use of alternative therapeutic modalities (i.e. yoga and mindfulness). She is trained and certified in the use of Integrated Listening System (iLs), Therapeutic Listening, Therapressure protocol, and S.O.S. Approach to Feeding. Her occupational therapy sessions are grounded in her view of each individual as a whole person – mind, body, and spirit. She works with clients in order to enable them to discover their true potential and flow through occupations with a greater sense of accomplishment. In addition to being an occupational therapist, Pamela has over 200 hours of training in the teachings of yoga, and is recognized as a 200-RYT (registered yoga teacher). She enjoys spending her free time practicing and learning from yoga, exploring new areas, and raising her rescue cat.